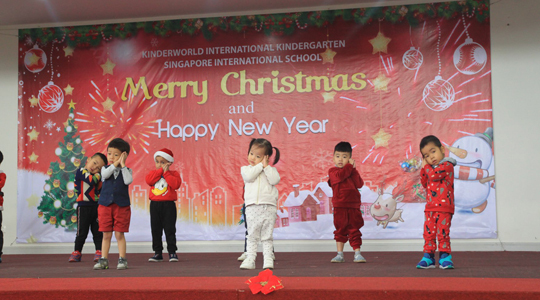 Several major school events are held every school year at KinderWorld International Kindergarten. These events provide KIK students with an opportunity to compete, celebrate, present and develop. They provide the school community with an opportunity for involvement and support. KinderWorld International Kindergarten sees these major events as an opportunity to showcase our students and school. 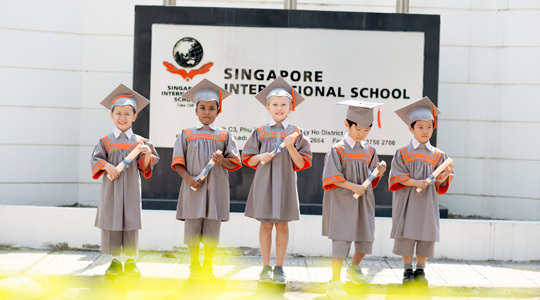 Completion of Kindergarten education for International and Integrated Prep students is marked by a Graduation Ceremony during which students receive their graduation certificates. The School Concert is one of the major highlights of the year providing an opportunity to showcase the talents of our students and to celebrate the end of the school year with all the fun and excitement associated with the preparation and presentation of class concert items. Students dance, sing and perform a variety of items with great enthusiasm for the pleasure of parents, staff and fellow students. School concerts are usually held within the final two weeks of school. Teacher’s Day is a special celebration in our school and in Vietnam. Teacher’s Day provides an opportunity to recognize the important role of the teacher and for students to show their appreciation and respect for their teachers. Each year, Teacher’s Day is celebrated on 20 November. KinderWorld International Kindergarten celebrates with a day of team games and fun class activities. Children’s Day is a day set aside to respect children’s personalities and to celebrate their happiness. The event is celebrated on various days in many places around the world. In Vietnam, we celebrate Children’s Day on the 1st of June every year. 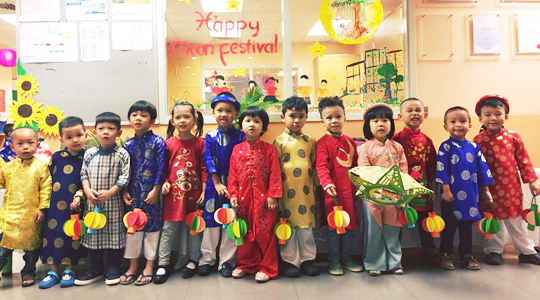 KinderWorld International Kindergarten organises fun activities on this day, such as a performance from a professional Dragon Dance Group or a Circus Company visiting the school, to entertain the children and provide a joy filled day of celebration. KinderWorld also provides a special gift for each child, given on this day, to signify our appreciation for the children at our school. We believe the children are our future. The Mid-Autumn Festival is a popular harvest festival celebrated on the 15th day of the eighth month in the Chinese calendar, during a full moon, which is in September or early October. Among the Vietnamese, it is considered the second most important holiday tradition after Tet. The festival celebrates the harvesting of crops and traditionally was a time to gather as a family and to give parents time to catch up with their children after the summer harvest was completed. 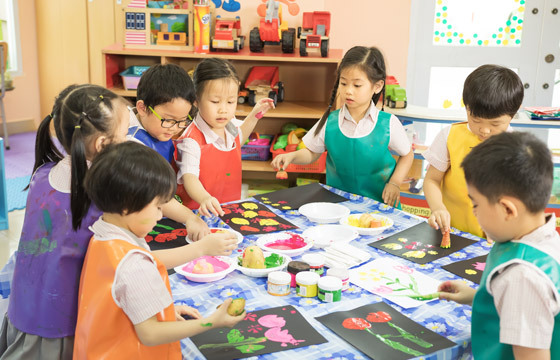 KinderWorld International Kindergarten celebrates this day with school based festivities and fun-filled events organized by teachers and students. KinderWorld believes in and understands the importance of investing in the human and social capital of Vietnam through its schools and business operations. The annual Christmas Charity Fair provides the KinderWorld community, through its students, parents and staff, an opportunity to contribute to a worthy cause within Vietnam. This annual event also serves to build compassion and empathy in our students fostering a commitment to improve the society in which they live. For this event, stalls are set up to raise money for a designated charity. Every year is different, with the creativity of students and staff contributing to the setup of games, activities, home-made crafts and food for sale. The atmosphere is alive with music, laughter and shared enjoyment. The Christmas charity fair is held in the first two weeks of December before Christmas break.